One of the marquee events in Macau is the 25th Macau International Fireworks Display Contest, and this year it runs on September 14, 19, 21, 28 and October 1. Set off in front of Macau Tower, there will be 10 teams competing, including Spain, South Africa, Switzerland, Canada, France, China and Portugal. For an up close view of the pyrotechnics you could head all the way up Macau Tower, but that could mean standing there all afternoon to guard your spot. 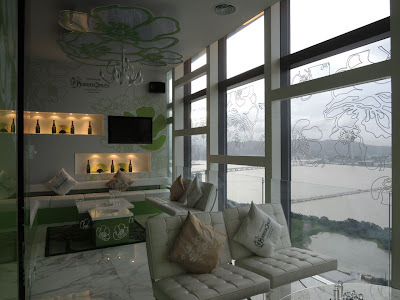 Why not watch the fireworks in style away from the masses at 38 Lounge at Altira on Taipa? On the top floor of the hotel is not only the lobby, but a posh lounge that's perfect for drinks in the evenings. There's always music, from DJs to live performances. And those flush with cash from their casino winnings can book one of two themed private rooms on the same floor. One is the Royal Salute, named after the Scotch Whisky with an over-the-top decor of plush royal blue couches studded with crystals that looks more like a VIP karaoke room. The other is the perfectly girly Perrier-Jouet room named after the Champagne from Epernay, France. The room is larger than the Royal Salute, and is decorated with line drawings of the Champagne's signature anemone on the windows and walls. Sit back, relax and soak in the view -- with Perrier-Jouet if you so desire -- and take in the fireworks with your BFFs.